Last week, we got an accidental glimpse of an upcoming Sony Xperia E5 – a rumored midranger, with an unknown release date got posted on Sony Mobile's Facebook page only to be pulled moments later – obviously a mishap, but a teaser none the less. Well, today, the E5 is officially unveiled, with its own page on the Sony website. 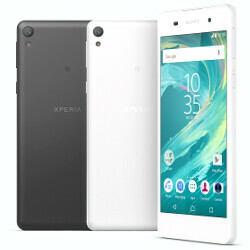 So, the Xperia E5 rocks a 5-inch display with a 720x1280 pixel resolution, a MediaTek MTK6735 SoC, 1.5 GB of RAM, and 16 GB of expandable memory. Its main camera has a 13 MP sensor and is capable of HDR photography, while the selfie snapper has a 5 MP resolution and is assisted by a front-facing LED flash. Its software is based on Android 6 Marshmallow and, based on the promotional photos, we can see Sony's new UI, which we've seen teased on the upcoming Xperia XA and Xperia X lines. The E5 will be hitting select markets in Europe, Latin America, Middle East, and Africa, with no word on a US launch at this time. In Europe, the handset will cost around $223 (€200). For 200€ its OK. Looks much more premium than other devices in this price range. Still, I don't understand why Sony is still trying to compete in this segment. They can't win on the hardware side against Samsung or Chinese competitors in lower mid range segment. J7 2016 costs similsr and is much better..
J7 cost $315, and no they dont cost similar. Sony your 2016 midrange pricing zuk. Mid range? With those specs? This is an entry level, the XA is low range, the X i mid range and the XP is the flagship. Then their pricingng really sucked. Front facing LED flash? I can not see it on the photos. Sony should fire the head of their mobile division, including the guy who hired him in the first place. They continue to released phones that are over price. Too expensive when it comes to the comparison with moto g series.